The nature of workplace bullying is similar to childhood bullying. Just like childhood bullying, workplace bullying is the tendency of individuals or groups to use aggressive or unreasonable behavior against each other. The only difference between workplace bullying and childhood bullying is that the abuse occurs in the workplace rather than a school playground. Workplace bullies are motivated by selfishness, insecurity and a desire to advance themselves while sacrificing other people's careers and financial stability in the process. There are certain tactics workplace bullies use to control another colleague, or to force a colleague to resign or be terminated. Commonly used tactics are social ostracism, and character assassination. In the workplace social ostracism is when coworkers or upper management intentionally exclude individuals or ignore individuals or emotionally withdraw. Social ostracism is acted out by not making eye contact, not talking, and not listening. Another very damaging workplace bullying tactic used is character assassination. Individuals that bully in the workplace such as colleagues, supervisors, and client/customers act out in ways to intimidate or humiliate another individual. 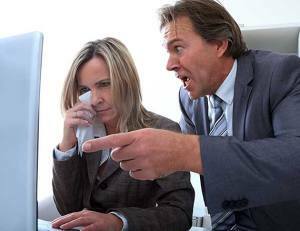 A workplace bully will throw a tantrum in public or make inappropriate comments to their target just to break the target down or somehow expose the target's weaknesses. The harsh truth about workplace bullying is that bullying is not always acted out by one employee or one manager. Many times more than one manager or co-worker may bully another employee at the same time. Victims are sometimes reluctant to report their bosses because they are led to believe that their bosses are out of control. Individuals who bully in the work place can be a co-worker, manager or client. Because of the roles these individuals play in the workplace environment they do all bully in the same manner. Destroy the victims reputation. The bully may spread false rumors about another co-worker. They may make the victim appear incompetent in the eyes of the victim's managers. May make verbal assaults. The bully may destroy the victims confidence and even tear down their self-esteem by negative criticism, ridicule and insults. Often interfere with victims work duties by denying victims the resources required to do their job properly. Assign demanding tasks to their targets with little time to complete task in, in order to set the target up to fail at the task then penalize the victim for not completing the task. May yell at their target or become extremely competitive with target. Managers may publicly humiliate their victim. Clients may use subtle and aggressive tactics to bully someone at work. Bullying this way gives clients a kind of power they wouldn't have in any other situation because usually a person will not verbally or physically defend themselves while being bullied by a customer while they are at work. Some clients bully employees by being over-demanding, difficult, picky, yelling, cursing, and even by throwing things at an employee. Some client bullies will even tell lies on an employee that they do not know. Client bullies that report employees under false pretenses will do so because there may be something about the employee's demeanor that they do not like. Other client bullies, bully for racially motivated reasons. An individual is most vulnerable while being bullied by a client in the workplace, because there is no way a client can be reprimanded for bullying an employee (unless management has enough integrity to "fire" customers that abuse their employees). Bullies that are customers find enjoyment in causing some employees grief, and by having the power to force that employee to deal with the harassment with a smile. Clients tend to bully more so in service environments because they know that these work environments typically hold high expectations for customer friendliness attitudes for their employees. Serial Bullying - Can de defined as one individual that picks on one employee after another and then moves on. Serial bullies are convincing liars. Serial bullies have somewhat of a natural skill to deceive others. Serial bullies are very controlling in nature and highly manipulative. Serial bullies are extremely stressful to work with because they are workaholics that hardly ever take time off from work or bullying their victims. Gang Bullying/Mobbing - This type of bully bullies with help from other colleagues. Workplace bully gangs flourish mostly in corporate climates. Gang bullying is also referred to as "mobbing". Gang bullying is typically found in work environments with inattentive management. Victims of gang bullying usually are intelligent individuals who demonstrate dedication to their employers. This type of behavior is anti-predatory behavior usually acted out by animals of a certain species. Some animals collaborate together to attack or harass another species in order to protect their offspring. In the workplace this mobbing behavior is acted out by groups of individuals to protect a job position or a status/ranking in the company that mobbers have little confidence they have secured. So incompetent bullies attack competent employees because they are seen as threats by the bully. Regulation Bullying - Where a serial bully forces their target to comply with rules, regulations or laws regardless of their necessity or appropriateness. Targets will be made to comply to the letter of the rules where the bully and their cohorts will be given a free pass -- even blatantly violating the same rules. Corporate Bullying - Is when an employee or supervisor bullies another colleague without mercy. Corporate bullies use tactics similar to stalking. This type of bully will spy on employees. They will go through an employee's work files and use video surveillance on their victims. This type of bully will even fabricate complaints about their colleagues and pressure others to fabricate complaints about their chosen victims. Corporate bullies usually are well secured in their job positions, and filing complaints against corporate bullies usually can backfire in an employee's face no matter what evidence they have to validate their claims of workplace bullying in corporate environments. Pressure Bullying - Bullies that pressure their colleagues do so by making their employees work unrealistic hours with inadequate resources and then they dare these individuals to complain. Employees usually feel obligated to work unreasonable time scales due to employee shortages in the company. Pressure bullying is most common in restaurants. Pressure bullies may yell and swear at others. Pressure bullying is a type of behavior that is usually displayed during a highly stressful moment at work. When there are important deadlines to be met or contracts the company may be at risk of losing then it is normal for individuals to become somewhat irritable. It is normal for individuals under intense stress to become short tempered and become slightly emotionally unstable. Most incidents of bullying are motivated by the bully's lack of self esteem rather than the specific personality trait of an individual. Many bullies find it hard to handle stress or work load of their job, so they may take their frustrations out on another colleague. Other bullies may have personality disorders that may contribute to their tendency to bully others. Bullies often bully others because they feel threatened by a colleague that may appear to be more competent in work duties than the workplace bully. Workplace bullies may consciously or unconsciously realize that they are harassing a colleague at work. Workplace bullying has very negative effects on employees and the companies where such behavior is displayed and tolerated. Targets of workplace aggression generally have lower levels of well being. Some victims of workplace bullying may experience a wide range of symptoms related to stress including headaches, stomach problems, depression, sleep disturbances and eventually even suicidal and homicidal ideation. Victims of workplace bullying typically find less satisfaction in their jobs and chosen career paths than individuals that are not bullied at work. When an individual is resentful of their job, manger, or work environment they may become cold to other colleagues at work. Individuals that are resentful of their work conditions may even be rude to clients and customers for no apparent reason at all. Employees in the hospitality service field, or have jobs that require them to service the public may not smile enough or show the type of friendly attitude towards customers that they should when they are being harassed at work. This behavior bully victims often act out, while being harassed at work can effect a company's overall sales and likelihood to retain regular customers/clients. Prevention Programs - Prevention programs can be implemented in companies that focus on reducing instances of workplace aggression. Peer mediation is an excellent program that can be beneficial in combating hostile behavior and conflicts in the workplace. Peer mediation is a confidential process that gives both parties an opportunity to discuss the dispute from their points of view to each other and to resolve their dispute in mutual agreement. Personnel Selection - (Neuman & Barron 1998) Workplace bullying can be prevented if more organizations use personnel screening and testing to identify potential employees who are likely to behave aggressively before they are even hired. This strategy prevents individuals who are predisposed to aggression from even entering the workplace. Training (Neuman & Baron 1998) Workplace bullying training programs for supervisors and employees are effective at teaching employees methods for dealing with aggression.